Year: 1939. Running time: 106 minutes. Color. Directed by Jean Renoir. Starring Paulette Dubost, Roland Toutain, Nora Grégor, Mila Parely, Gaston Modot, and Jean Carette. Aspect ratio: 1.33:1. In French with optional English subtitles. Mono. DVD release by The Criterion Collection. As he sat in the audience of the 1939 premiere of The Rules of the Game, director Jean Renoir watched a man methodically unfold a newspaper and light it--obviously with the intent of setting the theater on fire. This man was not the only angry viewer in the room; the audience was in a rage. Very quickly, the heartbroken director realized that he had made a deeply controversial film. Renoir had set out to use an elegant setting and an essentially lightweight story to voice his criticisms of a society that he found increasingly rotten. He had assumed the frothy nature of the plot would lessen the brutality of his message. However, at a time when Hitler was marching on Europe, audiences were sensitive to darkness in any measure, and they resented finding it at the movies, where they had gone to escape the escalated tension of their lives. The film only played for a few weeks before the government proclaimed it demoralizing and banned it in October 1939. Devastated, Renoir made major cuts in an attempt to win over the critics and his angry audience. He assumed that he had alienated viewers by appearing in his own work. Thus, his primary effort was to dramatically cut his own scenes. His character, the wisely philosophical but aimless Octave, provided the most humane observations in the film. His musings helped to explain how the brutality on display came to be. Without those observations, the shorter version was even harsher and received an even poorer reception. It was not until a 1959 restoration by Jean Gaborit and Jacques Marechal that Rules of the Game began to win its current reputation as one of the most beloved films. With Renoir's blessing, the men used negatives and guiding documents to restore as many scenes as possible. For the most part, they brought back those scenes with Renoir and thus the original, less biting tone of the film. This new version debuted at the 1959 Venice Film Festival to great acclaim. Now, in a two-disc DVD release from the Criterion Collection, this 106 minute restored version is available. With essays, interviews, documentaries, and scene studies, the package provides a thorough examination of one of the most beloved and beleaguered films in the history of cinema. The Rules of the Game is also immensely entertaining and enjoyable from the most superficial level down to the themes at its core. Most of the movie's action revolves around three love triangles. Upstairs, Christine de La Chesnaye (Nora Gregor) indulges in a flirtation with pilot Andre Jurieu (Roland Toutain). She is slow to realize how serious her suitor is about the relationship. Her husband, the Marquis de La Chesnaye (Marcel Dalio), struggles to end an affair with Genevieve de Marras (Mila Parèly) that dates from before his marriage three years ago. Downstairs, gamekeeper Schumacher (Gaston Modot) tries unsuccessfully to keep his less than devoted wife, Lisette (Paulette Dubost), who is more attentive to her mistress, Christine, away from the new domestic, Marceau (Julien Carette). During the course of a hunting party at the La Chesnaye estate in Sologne, these groups show that their allegiance to the customs or "rules" of their various societies are more important to them than what their souls dictate. They conceal their true natures with hunting, flirtations, card games and impromptu stage performances, but they ultimately cannot block out the glory and tragedy of human nature. These characters are so oblivious that they cannot distinguish entertainment from reality. When the hunt also loses its boundaries and claims the life of one of their own, they are not outraged. They look upon the tragedy as a flaw in that evening's performance. Those who do protest are shushed and ordered to keep up appearances. At the center of the film, a justifiably famous hunting sets the stage for the equally deadly costume party to come. Wounded birds fall from the sky. Rabbits roll across the ground from the force of gunshots and curl up in quivering submission to death. When it is finished, the hunters pack up their rifles, smug in the satisfaction that they have once again done their duty. They do not consider themselves killers, but rather, well-dressed participants in a time-honored ritual. In the end, even death does not shake these characters from the comforting restraints of their various societies. By adhering to the rules, they may be blind to the rest of the world, but they also believe they are protecting themselves from pain and self-doubt. No wonder that the premiere audience in 1939 was in such an uproar. With a light disguise of comedy, Renoir told them that not only were the rules of society a harmful smoke screen over human needs but also the rules would not offer protection from the danger approaching on the horizon. 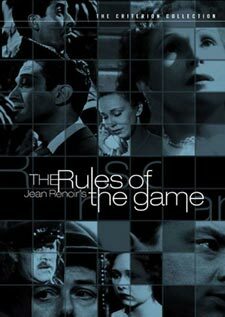 The Rules of the Game is now available on DVD from The Criterion Collection in a new high-definition digital transfer with restored image and sound. The two-disc set includes several special features: an introduction by Jean Renoir; audio commentary by film scholor Alexander Sesonske (read by Peter Bogdanovich); selected scene audio commentary by Renoir historian Christopher Faulkner; Jean Renoir le Patron: La Règle et l'Exception (1966), a French television documentary; and interviews with Renoir, actor Marcel Dalioi, set designer Max Douy, and assistant cameraman Alain Renoir (Jean's son). Suggested retail price: $39.95. For more information, check out the Criterion Collection Web site.